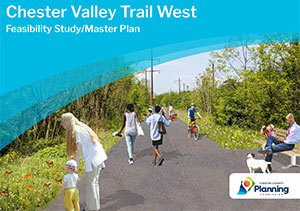 The Chester County Planning Commission is pleased to announce the completion of the Chester Valley Trail West Feasibility Study/Master Plan. The plan will extend the popular trail westward across the county through the following municipalities: Downingtown, Caln, Coatesville, Valley, Parkesburg, Sadsbury, West Sadsbury, and Atglen. The goal of the study was to identify and evaluate potential routes for extending the trail westward and connecting with the future multi-use Enola Low Grade Trail located just outside of Atglen in Lancaster County. The study also sought to identify potential linkages to nearby points of interest and will examine “Trail Town” precedents for using a long-distance, multi-use trail to spark recreation-centered economic development. The recommended alignment for the Chester Valley Trail (CVT) West is over 20 miles long and includes both multi-use trails and on-road /split mode connections. Accordingly, the alignment has been divided into nine segments, each of which could be developed separately. The project team recommends three segments as early action or short-term projects: Beaver Creek segment, West Sadsbury segment, and the Atglen segment. It is likely that both the P&T section of the Chester Valley Trail and the Enola Low Grade Trail in Lancaster County will be built before most –if not all– segments of the CVT West. This would create a gap between these two trails which otherwise form a continuous multi-use trail connection between the Susquehanna River and Philadelphia. Long-distance cyclists would benefit from an on-road bike route to fill this gap. Creating this signed and improved interim on-road alignment is recommended as the first phase of this project. When complete, the CVT West will connect with the Enola Low Grade Trail and the Northwest Lancaster River Trail to the west and the Schuylkill River Trail to the east to create a proposed continuous multi-use trail network between Harrisburg and Philadelphia. View the report.